MASCOT’s mission was successful. It was designed to be short-lived. The lithium-ion battery was expected to last about 16 hours, and it lasted a little longer than that. It took readings at its landing location with the four instruments in its payload, and then it used its swing-arm to hop to another location to gather another set of data. “It could not have gone better.” – Tra-Mi Ho, DLR Institute of Space Systems. There were some tense moments in MASCOT’s brief mission. As its mother ship, Hayabusa2, descended towards Ryugu, MASCOT was deployed at about 51m above the asteroid’s surface. It fell freely toward the surface at about the same speed as a pedestrian walking pace, and reached the surface after about 20 minutes. Landings like this are always difficult points in a mission, even at this slow rate of descent. Once on the surface, MASCOT got to work. The little hopping robot has four instruments on board: a camera, a spectrometer, a magnetometer and a radiometer. Each of the four worked properly and transmitted the data back to Hayabusa2. From there, the data will be sent back to Earth. MASCOT travels by hopping because that suits its destination best. Ryugu is small; only 1km in diameter. If MASCOT had wheels, it would have immediately been propelled from the surface of the asteroid when it activated them. There’s not enough gravity to keep it there. The Hayabusa2 mission is a scientific mission. But asteroids are objects of interest for other reasons, too. They’re chock full of metals. According to Asteroid Resources, which hosts a website with estimated asteroid values, Ryugu is worth approximately US $82 billion. According to chemical analysis, it’s rich in nickel, iron, and cobalt. 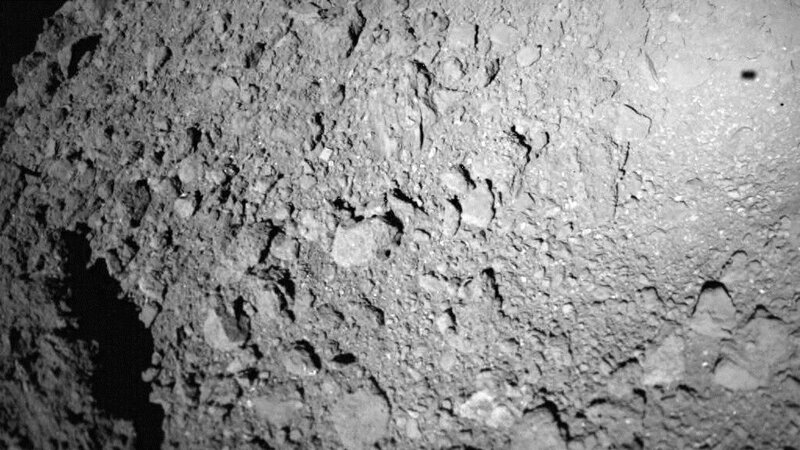 Hayabusa2 previously released two other rovers onto Ryugu. They were also little hopping robots, named MINERVA-II1A and MINERVA-II1B. Another optional robot is still onboard Hayabusa2, ready to be deployed. Next year, Hayabusa2 itself will venture down onto the surface of Ryugu. This is the culmination of the Hayabusa2 mission, which at its heart is a sample-return mission. The spacecraft will take three separate samples that should be delivered to Earth in 2020.